I have a love-hate relationship with meringues. I’ve talked about that before. And here I am at it again, but this time with a little inspiration and direction from The Meringue Girls. 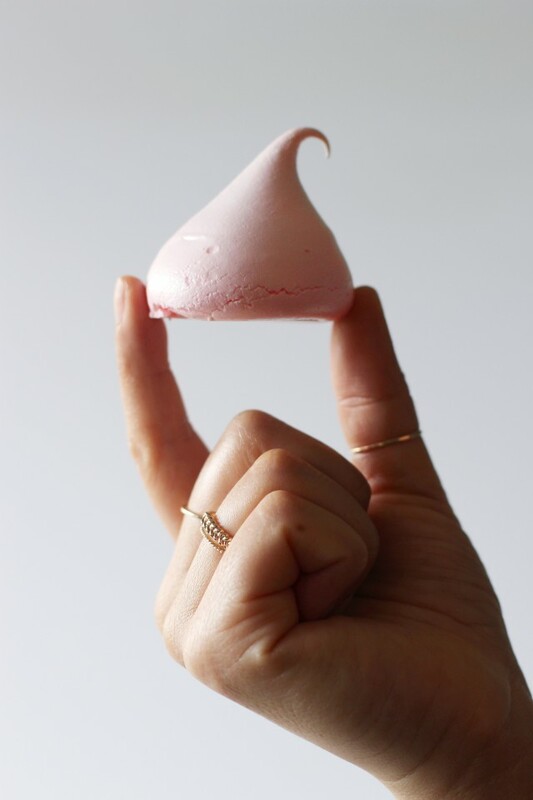 Their recipe for meringue kisses heats the caster sugar before adding it into the egg whites and, after a few trials, I have to say it’s pretty amazing! (Also, just check out their vast array of flavors and colors, so cute right?). 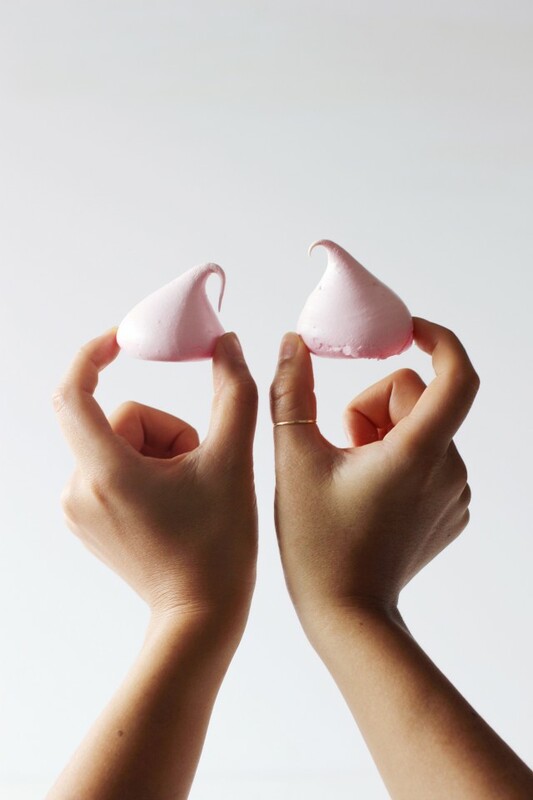 In honor of Valentine’s Day, I made these simple light blush pink meringue kisses. 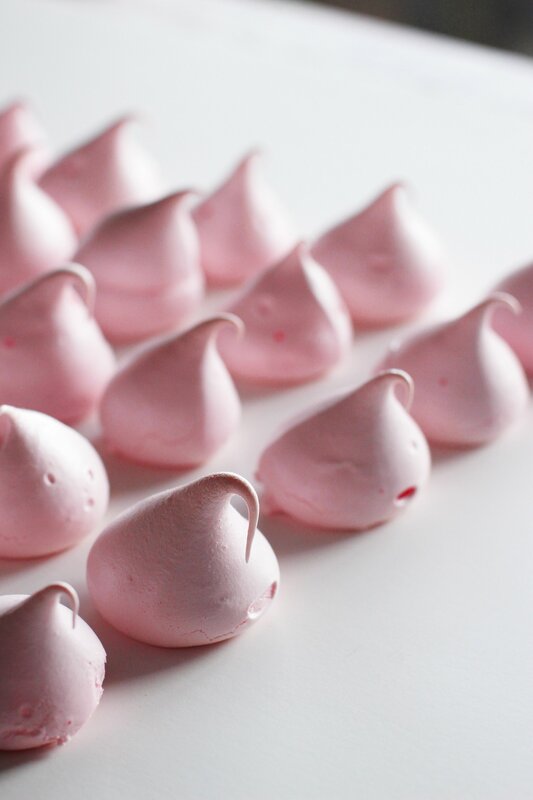 The kisses are a lot easier to make because they bake faster than regular large meringues. Wipe down the whisk attachment and the bowl of a stand mixer with a little vinegar or lemon juice and wipe clean with a paper towel. This helps get rid of any oil that may prevent your egg whites from forming peaks. Preheat the oven to 400 degrees. Line a baking sheet with parchment paper with the edges of the parchment paper hanging off the side of the baking sheet so it’s easy to pick up after it comes out of the oven. Pour the sugar down the center of the parchment paper. Heat the sugar for 5 minutes until the edges are just beginning to melt. Meanwhile, start whipping the egg whites on slow speed. Once bubbles have started forming, turn the speed up to medium/high speed. Continue whisking until you can clearly see whisk trails forming. (There is such a thing as over-whisking so keep your eye on the egg whites). Grab the sides of the parchment paper together to form a funnel for the hot sugar and begin to add the sugar with the mixer running a little at a time. Make sure the whites come back to a stiff peak after each addition. Turn the oven down to 200 degrees. Once all the sugar is added, add a few drops of red food coloring until you get the shade of pink you want and let the mixer run for about 2-3 more minutes or until the sugar is dissolved. You can test this by taking a bit of egg white and rubbing it between your fingers to feel for sugar granules. Again, be careful not to over-whisk the egg whites. Fill a piping bag with the egg whites and cut a hole at the tip about 1 inch in diameter. Line a baking sheet with parchment paper and dab the underside with a little bit of the meringue mixture in each corner so the parchment paper doesn’t move around. Pipe little meringue kisses on the parchment paper. 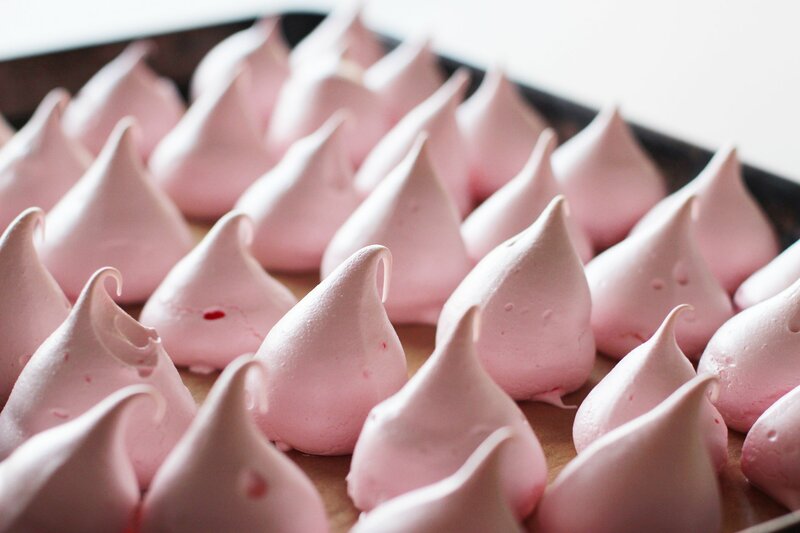 Bake for about 30-40 minutes until the meringues can be easily lifted off the parchment paper. Store in an airtight container. 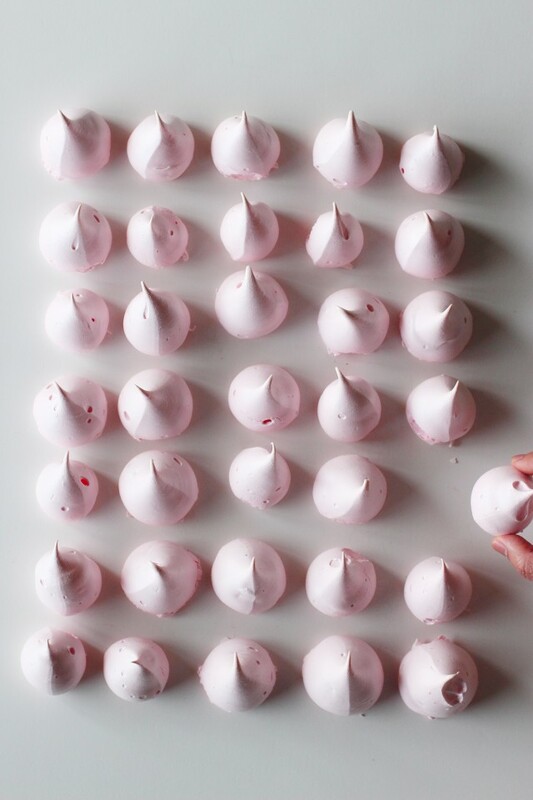 Meringues will keep up to two weeks. Embarrassed that I’m asking but – I looove your rings, can I ask where they’re from?! I agree with Liz, that pink color is just beautiful! This blush of pink is just the perfect hue. Love them! These are so pretty and perfect for Valentine’s Day! These are sooo cute! 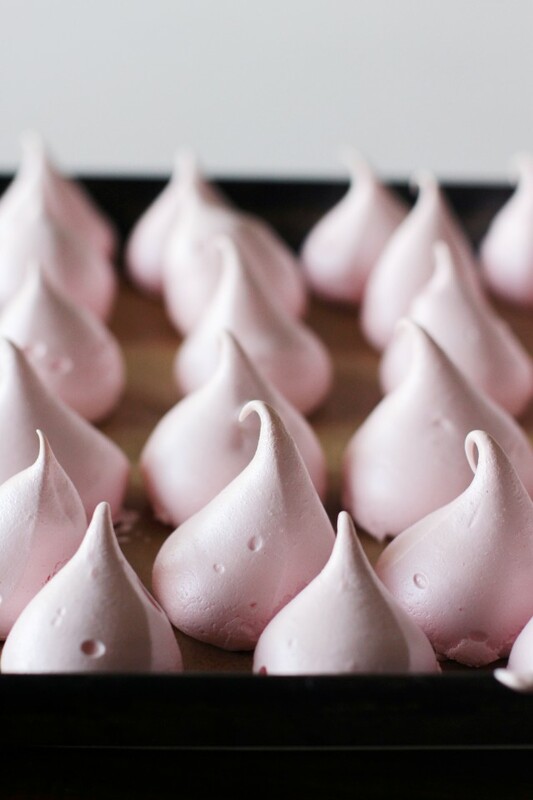 I love the colour and I love that they’re smaller and bake faster, meringues can be so frustrating sometimes. My last batch was a mess and it’s been almost a year since I’ve tried again. 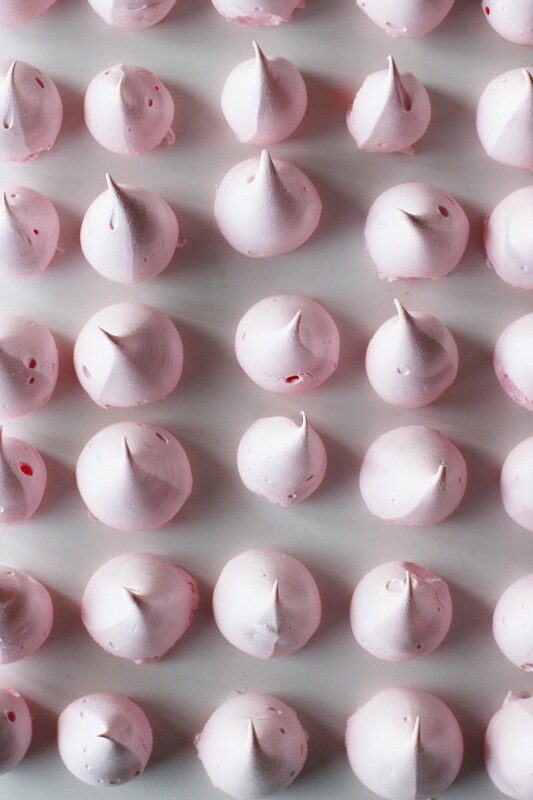 I’m always intimidated by meringues, but these look so beautiful I think it’s time to finally give them a try. Thanks so much for posting, such a cute idea for Valentine’s Day! These are so pinned! I love them! These are so perfect, love the delicate pink color!